ICIMOD participated in a discussion and mountain fair programme organized by the Ministry of Chittagong Hill Tracts Affairs (MoCHTA) on December 11 to mark International Mountain Day 2016 in Dhaka, Bangladesh. In line with this year’s theme. “Mountain Cultures: Celebrating Diversity and Strengthening Identity”, ICIMOD and the Bandarban Hill District Council celebrated hill culture, diversity, and identity. Secretary of MoCHTA, Naba Bikram Kishore Tripura, chaired the discussion programme. He highlighted ICIMOD’s contributions to promoting sustainable development in the Chittagong Hill Tracts (CHT), an area that epitomizes mountain culture and diversity in Bangladesh. The region is crucial to strengthening identity, and strengthening customary local traditions, practices, and languages is critical in this regard. Tripura thanked ICIMOD and Golam Rasul for bringing out a vision document for CHT on sustainable development goals. Rasul shed light on the importance of cultural heritage. He talked about the embedded value through which mountain culture, and the identity of CHT’s ethnic communities can be strengthened. Minister Rashed Khan Menon inaugurated the mountain fair programme. Its key objectives included highlighting the importance of mountain people, who, as largely farm and non-farm based producers, have diversified livelihoods . The fair is a five-day programme that will continue till December 16. 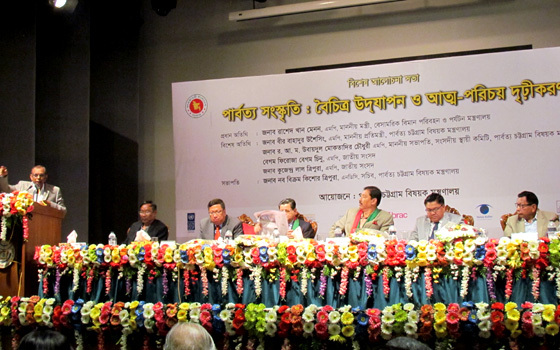 It intends to benefit the people of Ruma Upazila, Bandarban district, and hopes that the exhibition of local handcrafts, food, horticultural and agricultural produce, and traditional attire, will help get word on Bandarban further out. All of the local products have been grouped together under the ‘Bandarban’ brand. 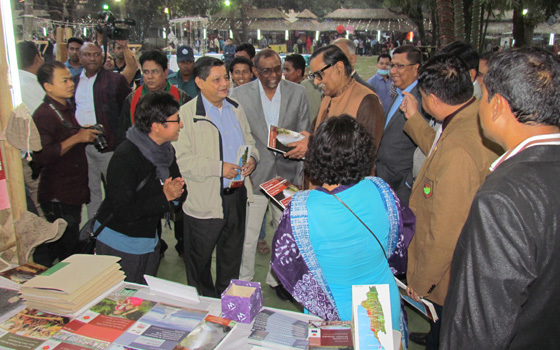 Menon and other dignitaries present on the inaugural day showed great interest in learning about the Bandarban tourism pilot project, the Bandarban brand, and the products on display. Altogether, 63 stalls are exhibiting at the fair. ICIMOD publications, posters and photos are being displayed in one of them, and questions from visitors are most welcome. Other stalls showcase mostly textiles and handicrafts, and the local dishes and drinks of the CHT. A cultural programme showcasing local culture was put up on the first day of the event. Civil Aviation and Tourism Minister Rashed Khan Menon presided over the inauguration as chief guest. Other dignitaries, from State Minister to Councils Chairmen (Rangamati, Khagrachari and Bandarban) were also present on the inaugural day. A message from David Molden, Director General of ICIMOD, was shared with the attending dignitaries.